This book builds on their previous joint collaboration, which ran to four editions, entitled The Scottish Parliament: An Introduction. This new version covers much of the same material, but it has removed coverage of the Scottish Parliament’s relations with local government, and replaced it with a new chapter on the challenges that have been made to the legislation of the Scottish Parliament. The stated aim for the text is that it should be concise but comprehensive. It gives a full explanation of the workings of the Scottish Parliament and the context within which it operates. The explanation is illustrated by details from the history of the Scottish Parliament and the Scottish Government since 1999. There are also references in places to how the devolution process has operated in Wales, which make a useful comparison. The “making sausages” parts of the book are Chapters 4 (How the Parliament Works) and 5 (Making Laws). These provide a helpful discussion of the process. There are three other chapters which I am sure will be of particular interest: Chapter 7 (Relations between Scotland and Westminster) Chapter 11 (The European and International Dimensions) and Chapter 12 (Reshaping Britain). The case of Miller v Secretary of State for Exiting the European Union is discussed. The book notes how frequently the Sewel convention is used in practice, while the Miller case confirmed doubts about the practical legal effect of an amendment to the Scotland Act 1998 which sought to enhance their position. The four successful challenges to Acts of the Scottish Parliament have all been based on breaches of the European Convention on Human Rights. This indicates the significance of the ECHR in the current Scottish constitutional set-up. The potential effects of Brexit are referred to. The book is clearly written and informative. It will be very useful to students and legal practitioners needing an accessible source of reference to the work and workings of the Scottish Parliament. 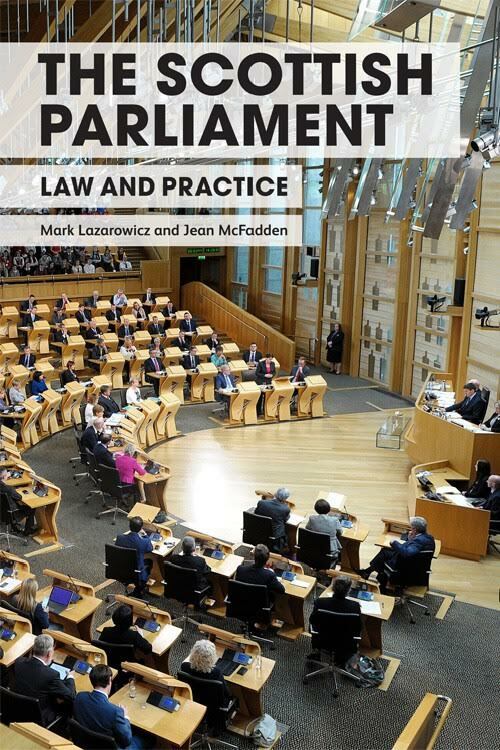 The Scottish Parliament: Law and Practice by Mark Lazarowicz and Jean McFadden. Published by Edinburgh University Press, (£40 Paperback) 296pp.